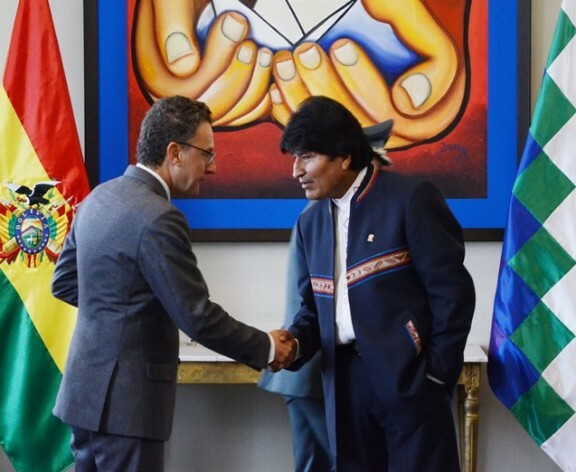 VIENNA, Aug 18 2015 (IPS) - The United Nations Office on Drugs and Crime (UNODC) has praised Bolivia for reducing coca bush cultivation for the fourth year in a row. According to the latest Coca Crop Monitoring Survey, released Tuesday in La Paz, coca cultivation declined by 11 per cent in 2014, compared to the previous year. The surface under cultivation declined from 23,000 hectares (ha) in 2013 to 20,400 ha last year, hitting the bottom since UNODC began its monitoring survey in 2003. Through the use of satellite imaging and field monitoring, reductions in the two main areas of cultivation were detected. The regions of Los Yungas de La Paz and Trópico de Cochabamba together constitute 99 per cent of the areas under coca cultivation in the country. Between 2013 and 2014, these two areas reduced their surface under coca cultivation by 10 per cent and 14 per cent respectively, from 15,700 to 14,200 ha and from 7,100 to 6,100 ha. In the Norte de La Paz provinces the cultivation area decreased from 230 to 130 ha, reports the survey. There are 22 protected areas in Bolivia – accounting for 16 per cent of the country’s surface – where coca crops are forbidden by Bolivian law. In 2014, there were 214 ha of coca crops detected within six protected areas, of which 59 per cent were in Carrasco National Park. In February 2013, Bolivia re-acceded to the 1961 Single Convention on Narcotic Drugs with a reservation on coca leaf. This reservation allows the chewing, consumption and use of the coca leaf in its natural state for cultural and medicinal purposes, as well as its growth, trade and possession to the extent necessary for these licit purposes. The reduction of the surface under coca cultivation in 2014 is mainly explained by the Government’s efforts to reduce the surplus of coca crops in permitted areas – known as ´rationalization´ – and to eradicate coca crops in prohibited areas, UNIS added. A dialogue-based process led by the Government saw the participation of coca growing unions in the implementation of the national strategy to reduce the surplus of coca crops in permitted areas. Another important factor has been the abandonment of old coca fields in the Yungas de La Paz province, due to the drastic reduction of their coca crop yields. Between 2013 and 2014, the area eradicated declined by two per cent at the national level, from 11,407 to 11,144 ha. Meanwhile at the provincial level, some 7,400 ha were eradicated in the region of Trópico de Cochabamba, around 3,200 ha in the Yungas de La Paz and Norte de La Paz provinces, and 526 ha in the Santa Cruz and Beni regions. The potential coca leaf production in the country was estimated to be 33,100 tonnes in 2014. Between 2013 and 2014, the total value of the coca leaf production declined from 294 million dollars to 282 million. The total value of coca leaf production in 2014 represented 0.9 per cent of Bolivia’s overall gross domestic product (GDP) and 8.8 per cent of its agricultural sector Gross Domestic Product (GDP). The amount of coca leaf traded in the two authorised markets – Villa Fátima and Sacaba – was around 19,800 tonnes in 2014, equivalent to 60 per cent of the total production of coca leaf. Ninety-three per cent of the legally traded coca leaf was marketed in Villa Fátima, and the other seven per cent in Sacaba. The average weighted price of coca leaf in these authorised markets increased six per cent, from 7.8 dollars per kg in 2013 to 8.3 dollars per kg in 2014.